Running a bar can be a great way to spend time with friendly customers, meet new people, and also generate incredible profits over time. However, running a bar efficiently and effectively also requires preparation, a lot of knowledge, and a few organizational tips. A well-organized bar runs more smoothly, and customers will be able to sense this. 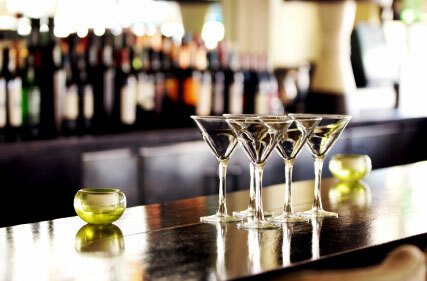 When your bar is well organized, your customers will receive their drinks in a more timely fashion. You'll also be less likely to waste money on purchasing liquor and other products that you don't need. Here are some tips for effective bar organization and operation. A popular bar may receive hundreds of drink orders in a single evening. Keeping up with these orders can be very difficult unless there is some system by which orders are entered and filled by the bartender. Many bars use a computerized order entry system that displays, for the bartender, the drinks that need to be made in the order in which they need to be made. However, a computerized system is not a necessity. Writing drink orders on order sheets and placing these on an order carousel is a cost-effective way to ensure that customers receive their drinks without having to wait. The arrangement of the liquor bottles behind the bar is another important attribute of effective bar organization. Displaying your bottles in an aesthetically pleasing way is just as important as displaying them in a way that is easily accessible to the bartender. Many bars illuminate their liquor bottles because the sight of glowing bottles is pleasing to consumers. Lit bottles of liquor may entice customers to purchase "top shelf" drinks that use expensive liquors. Typically, the pricier bottles of liquor are positioned in a place of prominence on the top shelf, which is where the term "top shelf" liquor gets its name. Inexpensive liquors, often referred to as well liquors, are placed within easy reach. The bar glasses used for different cocktails must be effectively organized so that a bartender can easily get the glass needed for a particular drink. Highball glasses and old fashioned glasses are usually stacked next to one another, as these are the most common beverage glasses. Wine glasses and martini glasses can be hung from inverted racks beneath bar shelves. This keeps them safely out of the way so they will not be accidentally broken. Two tools that will be exceptionally useful in creating an efficient and streamlined bar operation experience are a jigger and a shaker. Jiggers are bartender tools used to measure out a single shot and a double shot of liquor. Most bartenders like to have several jiggers on hand, so that a clean one is always available. Shakers are used to make chilled beverages. The best shakers have straining attachments so that the drink can be poured into a glass without the ice. Separate strainers are available which can be placed inside the rim of a glass to keep the ice out of a drink. These bar tools and organizational tips will dramatically improve the operation standards of your bar. Better operation standards often mean more satisfied customers, so these steps are incredibly important.